Empower your students to reach for the STAAR®! 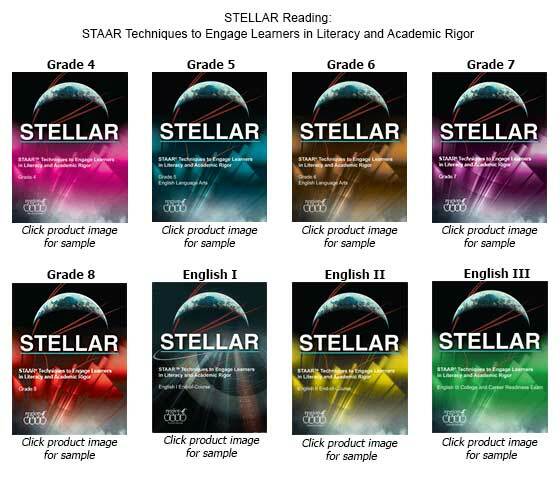 STAAR Techniques to Engage Learners in Literacy and Academic Rigor (STELLAR) incorporates multi-genre pieces, thematically linked to seamlessly align to the STAAR platform for assessments. Each module is creatively crafted to inspire inquiry, discussion, and ongoing reflection, offering added-value enrichments through technology, research, listening, speaking, and study skills. STELLAR provides relevant scaffolding options for diverse learners and gifted and talented students and includes summative and formative assessment options and suggestions for extensions that support authentic literacy experiences. Empower your students to reach for the STAAR®! STAAR Techniques to Engage Learners in Literacy and Academic Rigor (STELLAR) for Essay Writing English I–IV incorporates multi-genre writing opportunities linked to seamlessly align to the STAAR platform for assessments. Each module is crafted to inspire inquiry, discussion, and ongoing reflection, offering added-value enrichments through technology, research, listening, and speaking. STELLAR provides relevant scaffolding options for diverse learners and gifted and talented students and includes suggestions for extensions that support authentic writing experiences. Ordering through EMAT? Click here for product information. For more information, contact reading@esc4.net.